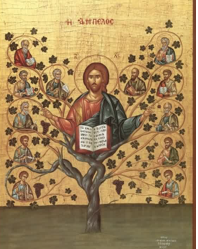 In the Gospel of John, Jesus teaches us that He is the vine which sustains us, the branches, and calls each of us to “bear much fruit”. As I pondered what fruit our Lord asks us to produce it dawned on me that this fruit is ultimately the salvation of as many souls as possible, including our own. All of the other things which Jesus instructs us to do such as making “disciples of all nations, baptizing them in the name of the Father, and of the Son, and of the Holy Spirit” are meant to lead all of us to eternal life with God in Heaven. As I reflected further, it reminded me of a story that I heard while having lunch with one of my clients. This client lived in a country which is rich in natural resources and people and is well situated geographically – factors which could serve as the foundation for peace and prosperity for its people. Sadly, his country was quite dysfunctional so I asked him why this was the case. This led him to tell me what I call the “Parable of the Crabs”. In this story, a man goes out on a boat with a friend who makes a living catching and selling crabs. As the crabber hauls in a new batch of crabs, he puts some in a basket which is covered tightly with a lid and the others he puts in an open basket. After observing this for a while his friend asks him why he puts some crabs in one basket and some in the other. “What about the crabs in the open basket – why don’t they escape as well?” asks his friend. 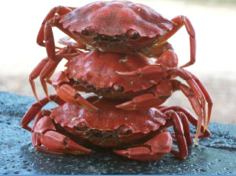 The crabber informs him that these are the self-centered crabs which cannot stand to see each other succeed. As a result, they fiercely pull down any other crab that’s trying to climb out of the basket so he’s never had one escape. My client then said with sadness – my countrymen are like these crabs and that’s why we can’t seem to make much progress as a people. This brings me back to our Lord’s command that we “bear much fruit”, the fruit of salvation for as many as possible. By using the image of us, the branches, being rooted in Himself, our Lord makes it clear that we cannot accomplish this mission without Him. We do well to deepen our relationship with Him through prayer, the Sacraments, and loving acceptance of the suffering our Lord sends our way to help prune away our selfishness and any other impediments that keep us from loving God with our whole heart, with our whole being, and with our whole strength. As we become more deeply rooted in Christ, we grow in love of each other and begin to care for each other like the crabs that helped each other escape from certain death and be saved. Those who become self-absorbed, like the crabs in the open basket, are on their way to perishing – to be thrown “into the fire” and to “be burned.” The more they make themselves the center of their universe, the less they are rooted in Christ and the more miserable and unhappy they become as they cut themselves off from God’s life giving love and from the love of others. Thanks to God’s mercy, He will welcome them back if they return to Him with a contrite heart. As members of our Lord’s Mystical Body, we are called to pray for and encourage all, especially those who have descended into the darkness and solitude that result from selfishness and pride.